Airbnb has grown into one of the top online marketplaces, global travel communities, and service platforms for individuals looking to book unique homes and experiences. Airbnb users who are traveling can use the site or app to lease or rent short-term accommodations, including apartments, homestays, holiday cottages, hostel beds, villas, hotel rooms, even castles and treehouses. There are nearly 5 million Airbnb listings worldwide, across 81,000 cities and 191+ countries, amounting to more than 300 million Airbnb guest arrivals all-time. 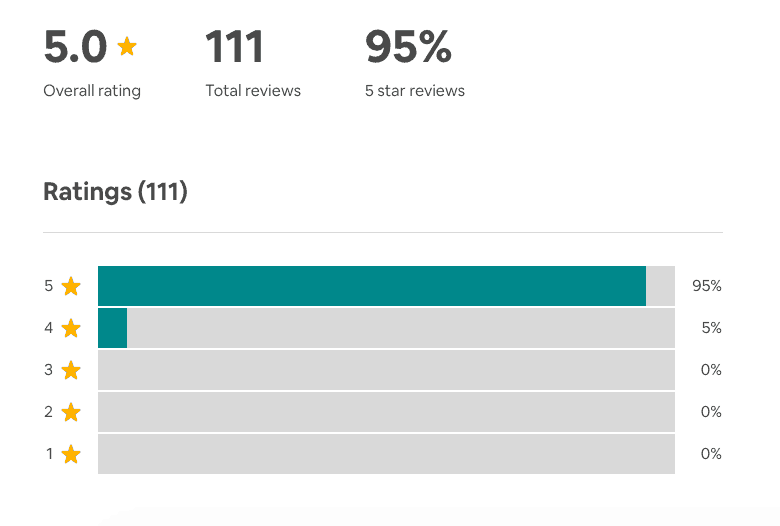 How Do Reviews for Airbnb Work? There are different types of Airbnb reviews that users can leave on the site or app. Public reviews: Up to 500 words that are visible to everyone in the community. Private feedback: A message to a host or guest to show appreciation or suggest improvements. Star ratings: Ratings for hosts from 1 (worst) to 5 (best) for the overall experience and for specific categories, including: overall experience, cleanliness, accuracy, value, communication, check-in, and location. You need to get 3 star ratings before your overall rating appears on your listing or profile. Group reviews: A public review that appears on the profiles of all of the guests on the reservation. There are no group reviews for Airbnb hosts. Cancellation reviews: If you cancel a reservation as a host, an automated review will be posted to your profile. These reviews are one of the host cancellation penalties and can’t be removed. But you, as a host, can write a public response to clarify why you needed to cancel. If you’re managing one or more listings on Airbnb, you can read all your Airbnb reviews by visiting your profile / clicking your profile photo on the top right corner of the site, or by navigating directly to your Airbnb Reviews page. As a host, you can share a review of your Airbnb guests, as well as receive reviews that will appear on the listing of the place in which your guest stayed. To encourage you to write reviews, Airbnb sends an email and notification after each trip asking you to review your guest. You have 14 days after the guest has checked out to write a review. This review will remain confidential until your guest has posted a review of their own, or until the 14-day review period has ended. This means that host reviews written by your guests will eventually be made public, regardless of whether or not you, as a host, left a review of your guest. As an Airbnb host, you cannot delete reviews by your guests unless these violate Airbnb’s content policy. You can report a review by going to Account, clicking on View Profile, and clicking the flag icon next to your Airbnb host review. You can respond to your guest’s reviews on Airbnb. To write your review response, go to Reviews then click on Reviews about you. Then find the review that you would like to respond to. Keep in mind that you have 14 days to write a response to a review. Airbnb’s Superhost program recognizes hosts who go above and beyond for every guest. Superhosts enjoy increased visibility in search results on Airbnb, exclusive perks, insider access, and an expanded set of business tools for hosting. Have no cancellations and honor every reservation (unless there’s an extenuating circumstance). As you can see above, one of the factors that Airbnb takes into account when identifying Superhosts is your overall rating. Your overall rating is the average star rating across all your Airbnb listings (if you’re managing more than one). Remember: Airbnb reviews can help drive guests to book your place. The more and better reviews your Airbnb listings have, the more likely you are to attract guests. Successful hosts are able to make connections with guests that enhance the experience, opening the doors to better reviews, a stronger online reputation, and increased bookings. I think the public reviews are definitely the most important when it comes to booking new guests but I have found there is a lot to be learned from private feedback. It is important to take everything people tell you into consideration when reviewing that feedback. People may help you improve a future stay in a way you had never considered before. Awesome article, and very accurate information. I had a question, Is there a way to highlight our best and most accurate review first? I did receive a tip from air-born to do this before but I didn’t do and now I can’t find how to do it! Just another way to promote our profile! I found a glitch on this review system. Me as a host, won’t get my good reviews up there without guest leaving their reviews for me. The glitch is that some terrible and disgraceful guests could deliberately not to leave any review or comments so that the bad but objective reviews they have received from the hosts won’t appear on theirs. In a way, they can just get away from that, easily. But the poor host missed out one point for that visit and NEVER have the day or share to other hosts how terrible hostuing experience they have gone through. They do not pass the place number and do not call the place to at least tend to help me. I stayed on the street and in the rain. In the end the cheap came out expensive and I had to rent a last minute hotel which came out much more expensive because at the time everything becomes much more expensive. Call airbnb and complain about this, you should be refunded and your extra costs should be reimbursed if the reasons that left you stranded were not your fault. If you are looking for renting a property through this booking site please read carefully and be aware. This is the worst part. Their computer system is completely corrupted. It has so many glitches that both the customers and hosts have their share of adrenaline floating. For one, you have to wait for the host to approve you. You can send a request for booking with conformation after making your payement, but 24 hrs later you may get automated message that your reservation was cancelled because you did not verify your account. You go again and repeat the process with the verification only to receive another cancellation next day stating you did not upload your picture. The host can send you a direct booking link, but if you don’t respond in 24 hrs , not 48 as the system tells you, you get a message that the host withdrew your booking and the property is no longer available. If you contact the host he/she will tell you they never sent such a message and that they got message that you cancelled the reservation. So it is absolutely ridiculous. Most places allow you to make changes with 48hrs. So you go in change your dates and send a message to the host requesting the change. However be aware that the system will not log in your change of date. It will only send the message. If your host does not respond in next 24 hrs, the airbnb rep will tell you that you passed your 48hr cancellation window and you are loosing your deposit. Take my advise and book through more reputable sites such as hotels.com, booking.com, agoda, or what ever else, but stay away from this site to save yourself the headache. I am sharing this with you as an expensive lesson I have learned. Do not make the same mistake I made. We had the worst Airbnb experience. The house we booked was double booked. We were in contact with the hostess who said she spoke to the cleaning people and the house was ready for us. She gave us the code and we went to the house only to find it a huge mess and other people’s belongings in the house. So, we phoned the hostess at which time she said oh I must have double booked it??? This was not secure (we had the code to the house and were able to walk in with other people’s belongings all over) so when booking your airbnb be aware you and your belongings are not secure. The hostess said she could not help us … so we made a 2 hour ferry ride and a 2 hour drive only to have no place to stay as the ferries were full. When we contacted airbnb they said they would look for another place for us but we would have to pay more as it was more expensive. We already ruled out those places because of the cost. Airbnb then told us we have already refunded your money and that we were on our own without a place to stay. We spent the next 3 hours trying to find a place .. we finally found a place that slept 4 and we had to cram 8 people and 4 dogs in it. I will never use airbnb again. Even when you confirm the day before you leave your reservation is not a guarantee. BEWARE OF AIRBNB. I am currently working with AirBnb to hopefully get a refund from a host that has taken my money and ran! She was untruthful about where her property was located, I felt unsafe so I did not stay there. I ended up booking a hotel instead. The booking was for 3 months, so I had to pay over $2000 upfront. When I asked for half of my money back since I never stayed there, the host declined. Be careful on this site, you will end up losing money if you don’t. I find it disturbing nearly every airbnb property is “5 stars”, and hosts seem to be embarrassed by anything less than 5. This is statistically unrealistic. Either the system is broken, or rigged, or what… I don’t know, or guests are just sheep and feel pressured into leaving 5 stars for everything just because that’s what everyone else seems to do. In my opinion guests should feel free to hand out 2, 3 or 4 star reviews unless the property is absolutely exceptional in which case it deserves a 5, and hosts should use this as a signal to price accordingly, or lift their game. I recently stayed in an airbnb (entire house) that was quite grubby. The kitchen and floors were all very sticky – we mopped on arrival and wiped the benchtops down with disinfectant, and felt we had to wash any utensils before using them. Yet this property had 5 stars. It even had 5 stars for the cleanliness subcategory! I’ve seen the argument that people weight their reviews on the basis of price paid, but that just confuses things. When we book hotels and we see a 5-star hotel we expect a certain level of cleanliness and amenity and are prepared to pay for it, and if we’re unwilling to pay for it we lower our expectations and stay in a 3-star hotel and accept the consequences for paying less. I don’t see how airbnb ratings should be any different. I am totally disgusted with the service of the host.Poor service. There were hidden costs, cleaning fees, service fees(not sure what service), transaction fees for any card used. Refund of cash not reflected in the so-called card. Lights not working in the apartment. I will not take up any airbnb in future. Totally disappointed. Can a host edit their review for a guest after leaving it? Hi MK, currently there is no option to edit a host review. Working with Airbnb is a terrible experience! We booked a property, they took our money only to find out that the property was not available. Now we have to wait for 2 weeks for a refund. Totally unacceptable! I would not recommend Airbnb at all, Homeaway is a much better and more trustworthy company! I’m absolutely disgusted! I agree with Ben that the Airbnb rating and review system is completely unreliable and therefore broken. The reason is that the rating system is based on an “I’ll scratch your back if you scratch mine” approach. Two years ago I booked a flat in London that had a 5-star rating and great reviews, yet it was so filthy that even Airbnb staff where shocked when I sent them photos. The host also was verbally abusive. Airbnb were pretty good and arranged for another property within hours of our arrival, and the host was removed from their system. But where did those five stars and great reviews come from? Once again Airbnb were cool and arranged for another property for us, and I left a truthful review, but I now have one negative review of me as a guest from this “con man,” who claims I was just being difficult and making it all up. Anyone who checks the new reviews of the house will notice that several of them mention the house being dirty and cold, verifying my review, but the house still has a 4.5 star rating, while I have a negative review as a guest that contains inaccurate information, but there’s nothing I can do about it. As I don’t want a second negative review as a guest, it means that if I were to end up again in a flawed Airbnb property, that I won’t leave a review. In short, Airbnb should be far more pro-active about vetting the properties and hosts, and tighten its interpretation of its “content policy.” If a host, or a guest for that matter, writes things that are verifiably untrue, this should be taken down, or at the very least the host or guest should have a right to reply.